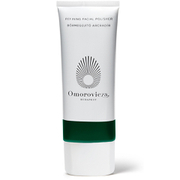 Whisk away impurities with Omorovicza Gentle Buffing Cleanser. Its gentle yet powerful formula is enriched with essential nutrients to remove dead skin cells, dirt and make up to leave skin with a brighter, smoother complexion. The physical and enzymatic peel balances skin and exotic fruit extracts work effectively to reduce pore size, without stripping natural oils. The lightweight cleanser contains diatomaceous earth, a mineral-rich rock which has an exfoliating action, making it the ideal light buffer and a non-abrasive alternative to aluminium based treatments. Vitamin C stimulates circulation and boosts radiance to give a healthy glow. Experience skin that is detoxified, renewed and refreshed. Apply evenly to entire face and massage using circular movements, concentrating on forehead, nose, cheeks and chin. Rinse thoroughly. 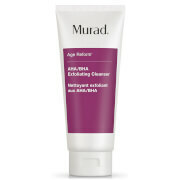 Use 2-3 times a week or once a week on dry or sensitive skin.